This article provides an IoT protocols list. There are several IoT protocols that are widely used in IoT connectivity with different features. This article wants to be a guide describing the most important IoT protocols, that enable to exchange data between different IoT devices and between IoT devices and IoT cloud platforms. It stands for Message Queuing Telemetry Trasport. Now it is an open standard maintained by OASIS group. MQTT is a machine-to-machine (M2M)/”Internet of Things” connectivity protocol. It was designed as an extremely lightweight publish/subscribe messaging transport and useful for connections with remote locations where a small code footprint is required and/or network bandwidth is at a premium. For example, it has been used in sensors communicating to a broker via satellite link, over occasional dial-up connections with healthcare providers, and in a range of home automation and small device scenarios. MQTT protocol runs on top of the TCP/IP networking stack. When clients connect and publish/subscribe, MQTT has different message types that help with the handshaking of that process. The MQTT header is two bytes and first byte is constant. In the first byte, you specify the type of message being sent as well as the QoS level, retain, and DUP (duplication) flags. The second byte is the remaining length field. The CoAP protocol is specified in RFC 7252. The Constrained Application Protocol (CoAP) is a specialized web transfer protocol for use with constrained nodes and constrained networks in the Internet of Things. Coap is designed for machine-to-machine (M2M) applications such as smart energy and building automation. The protocol is targetted for Internet of Things (IoT) devices having less memory and less power specifications. On top of CoAP, the Open Mobile Alliance (OMA) has defined “Lightweight M2M” as a simple, low-cost remote management and service enablement mechanism. • It is very efficient RESTful protocol. • Easy to proxy to/from HTTP. • It uses asynchronous transaction model. • UDP is binding with reliability and multicast support. • GET, POST, PUT and DELETE methods are used. • It uses small and simple 4 byte header. • Supports binding to UDP, SMS and TCP. • DTLS based PSK, RPK and certificate security is used. • uses subset of MIME types and HTTP response codes. • Uses built in discovery mechanism. The AMQP – IoT protocols consist of a hard and fast of components that route and save messages within a broker carrier, with a set of policies for wiring the components together. The AMQP protocol enables patron programs to talk to the dealer and engage with the AMQP model. AMQP has the following three additives, which might link into processing chains in the server to create the favored capability. It is maintained by OASIS as MQTT. Exchange: Receives messages from publisher primarily based programs and routes them to ‘message queues’. Message Queue: Stores messages until they may thoroughly process via the eating client software. Binding: States the connection between the message queue and the change. Rest stands for (Representational state transfer). This protocol, used as IoT protocol, is exploited to exchange data between applications and to integrate applications belonging to different domains. Moreover, it uses HTTP as based protocol. Rest uses client/server paradigm. Rest is widely used not only in IoT ecosystem. XMPP (Extensible Messaging and Presence Protocol) is an open standard for presence and messaging. This protocol uses XML messages The XMPP-IoT is designed specifically for IoT environment. Basically, this protocol enables users to send real-time messages and handles the user presence (Online, Offline, Busy). The IoT version enables users to send and receive messages from machines. Moreover, it is eXtensbile easily. STOMP provides an interoperable wire format so that STOMP clients can communicate with any supported message broker to provide easy and widespread messaging interoperability among many languages, platforms and brokers. It is the only one of these three protocols to be text-based, making it more analogous to HTTP in terms of how it looks under the covers. Like AMQP, STOMP provides a message (or frame) header with properties, and a frame body. The design principles here were to create something simple, and widely-interoperable. For example, it’s possible to connect to a STOMP broker using something as simple as a telnet client. It does not, however, deal in queues and topics—it uses a SEND semantic with a “destination” string. The broker must map onto something that it understands internally such as a topic, queue, or exchange. Consumers then SUBSCRIBE to those destinations. Since those destinations are not mandated in the specification, different brokers may support different flavours of destination. So, it’s not always straightforward to port code between brokers. However, It is simple and lightweight (although somewhat verbose on the wire), with a wide range of language bindings. It also provides some transactional semantics. One of the most interesting examples is with RabbitMQ Web Stomp which allows you to expose messaging in a browser through websockets. This opens up some interesting possibilities—like updating a browser, mobile app, or machine in real-time with all types of information. While IoT data protocols enable IoT devices to exchange information, IoT network protocols work at a lower level connecting IoT devices each other and with IoT cloud platforms. There are several IoT network protocols that work in a short or wide range. 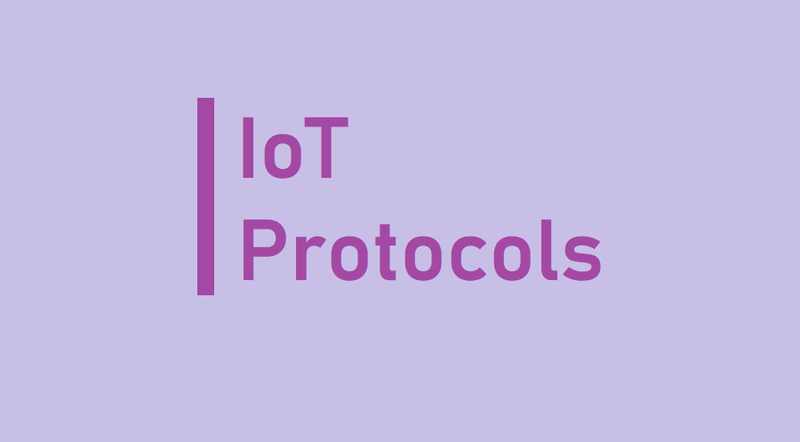 This IoT protocols guide will name the most important. Bluetooth is a global 2.4 GHz personal area network for short-range wireless communication WPAN (Wireless Personal Area Network). It plays an important role among IoT wireless network protocols. Device-to-device file transfers, wireless speakers, and wireless headsets are often enabled with Bluetooth. It used in connecting wearable devices. The BLE (Bluetooth Low Energy) is a low-energy version of the Bluetooth protocol that reduces the power consumption and plays an important role in connecting IoT devices. Sigfox uses free ISM band to transmit data over the very narrow spectrum. It is a low power consumption protocol that operates using Ultra Narrow Band modulation (around 200KHz). Sigfox was developed with the main target to transmit small messages without the need to keep the network connection. It is used in M2M data exchange. Sigfox is designed to handle low data-transfer speeds of 10 to 1,000 bps using an Ultra Narrow Band (UNB) technology. Sigfox overcomes the problem of Wi-Fi and cellular in many applications that has short Wi-Fi range, where cellular cost is high and consumes more power. SIGFOX is a French company that builds wireless networks, which is founded in 2009 by Ludovic Le Moan and Christophe Fourtet. Typically, it is an internet of things device that needs to transmit continuously in small amount data. Best use cases for Sigfox are electricity meters, smart watches, and washing machines. LoRaWAN is a WAN (Wide Area Network) protocol maintained by LoRa Alliance. LoRaWAN is a media access control (MAC) layer protocol designed for large-scale public networks with a single operator. It is built using Semtech’s LoRa modulation as the underlying PHY, but it is important to note that LoRa and LoRaWAN are two seperate things that are often (mistakenly) conflated. It is a low power protocol. It supports a secure bi-direction communication between IoT devices in M2M, smart cities and Industrial applications. Communications between IoT devices and gateway happen at a different frequency and data rates.